For those looking for a peaceful day away from city life, a visit to Winterthur in Delaware's Brandywine Valley may prove to be the perfect destination. Located halfway between New York City and Washington D.C., just southwest of Philadelphia, it is easily reachable for visitors all along the northeast. This sprawling estate features 60 acres of beautiful gardens surrounded by a landscape of woodlands, waterways and meadows, as well as museum filled with American antiques and artwork. Winterthur is a great choice for a one-day getaway for both families with young childen, and couples looking to spend a romantic afternoon together in a beautiful setting. While Winterthur does not get as much attention and publicity as nearby Longwood Gardens in Kennett Square, Pennsylvania, its more natural, less regimented garden designs make it uniquely worth visiting as well. All photos on this page are by the author, sockii, unless provided by Amazon. You can see my full Winterthur Photo Album at Flickr. Henry Francis du Pont founded the Winterthur Museum in Delaware in 1951 to share his collection of Americana artwork and collectibles with the public. But Winterthur became much more than simply a museum, as he went on to make it an amazing American country estate, similar to the English country houses he admired. H. F. du Pont had assumed control of these du Pont family lands in the 1920s. He was determined to preserve an agricultural way of life in America, which was waning as the industrial revolution responsible for his family's wealth continued to gain momentum. From the 1920s onward he expanded the Winterthur estate until, at its peak, it encompassed over 2,500 acres of woodlands, meadows, waterways, and naturalistically designed gardens. Winterthur was at one time a working farm with over 250 individuals employed to tend to the gardens, livestock and a dairy. The herds were sold in 1969 after H. F. du Pont's death, as per his wishes in his will, however the garden remains as a testament to his desire to preserve natural beauty. 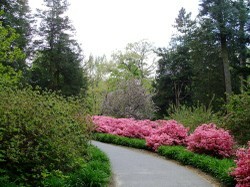 Today the Winterthur Garden consists of 60 acres of the estate's remaining 1,000 acres. The garden was carefully planned to look natural while still presenting attractive color combinations, and offering blooming flowers from January into November. Dainty snowdrops cover the hills in early February while crocus and daffodils blossom in March. The Azalea Woods come to life later in the month, leading into rhododendron, winterhazel, and Italian windflowers in April. Magnolias, cherry trees and forsythia follow until the peonies and snow balls bloom in May. Through the summer one can enjoy beautiful day lilies, hostas, spirea and primrose and many other delightful blooms. Come September the clematis are in bloom, and foliage begins to take a turn toward Autumn colors which continues into October and November. Walkable pathways and trails lead visitors through the various themed areas of the garden. Get lost in the Azalea Woods, covering over 8 acres under a shady cover of white oak, tulip-poplars and beech trees. Step out of the woodlands along Magnolia bend, where some of the Magnolia trees are over a century old. Bog-loving plants thrive in the Quarry Garden, which H. F. du Pont built when he was 82 years old, transforming an old stone quarry into a place of beauty. There is also a reflecting pool, the Sundial Garden, Winterhazel Walk, and many more areas to discover throughout the grounds. Winterthur is a great place to take children, especially those living in cities who may not have the chance to have fun in the open outdoors very frequently. The Enchanted Woods of Winterthur is a 3-acre area just for their enjoyment and playtime. Legend has it the Enchanted Woods were created by woodland fairies, who still live here today. Children will discover a Faerie Cottage, the Tulip-Tree House, and more puzzles, games, and safe places to explore. Fun for children, small or big! Henry Francis du Pont collected antiques to furnish his large country home, and many of them remain now that the home was been transformed into a museum. There are 175 period rooms displaying over 85,000 objects used or made in America between 1640 and 1860. The galleries showcase special examples of artwork, woodwork, metalwork, ceramic, glass, and textiles. For any enthusiast of American history, visiting the museum collection is a must. Witerthur features changing special exhibits in its museum, as well as regular programs for adults and children alike. "Wednesdays at Winterthur" is a weekly program at lunchtime on topics such as "Easy Shade Perennials," "Fairy Flowers of Enchanted Woods," and "Maintaining a Wild Garden." There are special garden walks, an 8-week course for children on growing a vegetable garden, and much more happening on a regular basis in the garden and museum. Winterthur is located at 5105 Kennett Pike (Route 52) in Winterthur, Delaware. Garden and museum hours change seasonally and from March to November are 10am - 5pm, Tuesday through Sunday. During the holiday season, Winterthur is open 10am - 5pm daily with some extended evening hours. The museum and garden close for Februrary entirely. The library is open 8:30am - 4pm, Monday through Friday. Adult admission is $20, with $18 discount rates for seniors and students. Children 2-11 are only $5 and infants are free. Why not plan a weekend in the Brandywine Valley, visiting both Winterthur and nearby Longwood Gardens? There is a long list of attractions in the area, including also the Delaware Art Museum, the Franklin Mint, the Brandywine Valley Wine Trail and the King of Prussia Mall. Many lodging and dining choices are nearby, from national chains to quaint country inns. Visit the Greater Wilmington & Brandywine Valley Visitiors Bureau for more information.